Find out how to choose the best coffee machine for your business with these helpful tips about purchasing and leasing. There are so many coffee machine options available for businesses today that it can be quite difficult to make the right choice. Machines vary from traditional, bean direct to cup, filtered, instant, to vending machines with a variety of everything. Is the price of the coffee more important to you than the quality? Or is speed a better option? Where will the coffee machine be positioned? Does it need an independent water supply? How easy is it to keep it well stocked? Will a member of staff be operating the machine? If so, how easy is it to train that person up should you one day need a replacement. 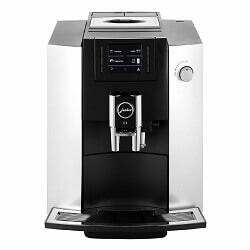 The JURA 15079 E6 delivers great tasting coffee for offices that don’t want to play barista. JURA have nailed the art of automatic, easy-to-use machines that don’t compromise on quality. At only £695, it’s very reasonably priced, too. If you’re serious about good coffee, look no further. Designed by Heston Blumenthal himself, The Oracle machine from the Sage range delivers an unbeatable cup of coffee. Yes, at £1,149.95 it’s a pricey bit of kit. But the glowing reviews prove it’s worth every penny. 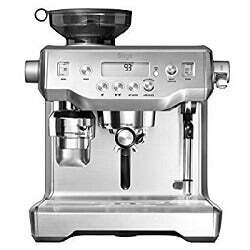 This De’Longhi model manages to pack a lot into a small and very affordable model. High pressure ensures a great taste, and the ‘one touch’ keep things quick and simple. It works with both ground coffee and beans. The best coffee of all will always be coffee that is made with coffee beans that are freshly roasted. Using fresh milk or cream is always a nicer taste than ultra heat treated (UHT) milk or even worse, powdered milk. Looking at cost per cup, you can’t beat using fresh milk and coffee beans. 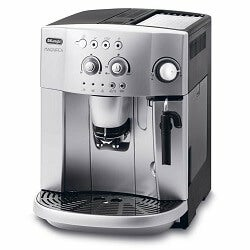 If you were thinking of using a coffee machine that can produce the most popular of the speciality coffees then you need a machine that is capable of producing a good quality espresso. Espresso may not be the coffee of your choosing, but it is the base ingredient for lattes, cappuccino and so on. Frothy coffee is important too, so you should consider a machine that is able to steam and froth milk. When it comes to a machine that will be self vending, then easy to clean and simply to operate would be a major factor. Having a barista operated coffee machine, say if you ran a coffee shop or restaurant, would produce the best quality coffee, but would need the skill of the barista operator and time for cleaning too. You wouldn’t want a machine that is too clunky and noisy if it was sitting in a quiet corner of an office. Once you have decided what type of machine to opt for, finding the best one within your budget won’t be too much of a problem. As with most commercial products and services, the price will vary enormously as to whether you want an ongoing maintenance service, or if you are buying the machine and propose to service it as and when you feel the need. Depending on the person you are serving the coffee to will depend ultimately on how much you should spend. Start by looking at commercial coffee machine suppliers and service contractors to weigh up whether it’s better to buy or lease. Capsule vending machines will need restocking, other machines that just require hot water will be simpler to run. Do your research to ensure you get the best coffee you can at a price that’s right.